There may come a time for any small business owner when a credit card becomes necessary. For some, it may be caused by a temporary cash flow problem, while for others it could be necessary in order to allow employees to make a company purchase. Whatever the reason, small business owner should be aware of the potential hazards of using a credit card, as well as the possible benefits. Though credit cards in general have received a negative connotation in the last few years, when used correctly, they can be a powerful tool for a business owner. Emergency funding – When cash becomes tight, a credit card can provide quick access to emergency funds that can be used to pay vendors and make special purchases. This can keep operations going and allow the business to continue to provide service to customers. Build up credit – Using a credit card for general business operations, and paying off the balance each month, can be a good way to build a good credit score for the business. Then, when it comes time to apply for a loan in order to expand the business, success will be more likely. Rewards programs – Certain cards provide customers with perks, such as frequent flyer miles, that can also be used to reduce expenses for the business. Finding one that fits the needs of the business is important, since using one that doesn’t provide any benefit will not help the company. Easier to acquire – Being approved for a credit card is usually easier than applying for a business loan. Credit companies may have less stringent requirements than banks. Despite their many benefits for business owners, credit cards can also prove to be a hazard in the wrong situations. Damaged credit – Consistently paying the bill in full and on time each month will result in a good credit score, but if the bill cannot be paid on time the result will be damaged credit, extra fees and higher interest rates. All of these will have a negative impact on the business. Personal liability – Since the owner of the business will be the one applying for the business credit card, they likely will also have to agree to be personally liable for any debt accrued on it. If something happens to the business, they will still have to pay what is owed on that account. Increased debt – If only the minimum amount is paid each month and not the total amount due, the higher interest rates of a credit card can quickly make the company’s debt unmanageable. As with any business tool, how a credit card is used will determine whether it is a positive or a negative for the company. Being aware of the potential pitfalls of a credit card, and avoiding them, can help a small business continue to operate with success. 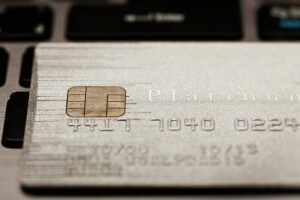 What are your thoughts about using credit cards as a small business owner? Feel free to leave your comments below, and our team will happily answer any questions that you have about using a business credit card. About the author: Claire Atkinson writes for Kanetix.ca, a financial services comparison website that has more tips on business credit cards and other financial products. I have found that the use of a business card helps with the accounting at the end of the year. Merging business and personal stuff requires that you break them out. If you use a card just for business, it makes that breakout much easier. Building your credit as a business is a great idea. I would not use the card unless I knew I could pay off the balance in full each month. That said, it is also reassuring to have it in the case of emergencies. That’s also a great point about the awards. That had a great deal of appeal to me when I did select a business credit card. I had it for several years and I racked up lots of frequent flyer miles. Along with building credit, I thought that was a very nice perk! Thankyou for your feedback Phyllis – I wonder if you need to declare your business miles as some kind of benefit in kind – or whether it can just quietly remain as a perk of the job. Using credit for business is risky. In this day in age, its good to have it handy but only to use as a last resort or for unique online purchases or services. It’s good to have the option of using credit if your business might need it. A lot if it has to do with good planning and personal finance management. Why do you think it is risky Fonso? From a fraud point of view, or because of running up un-managable debts? I agree with previous posts. As with any credit card, business credit should be used wisely. Recently, I helped a friend get her small business started. We found that the business card was helpful for larger purchases for the shop. Also, the smaller incidentals went to that card as well. That way, at tax time she was able to separate her expenses accordingly. Also, we had to be sure to diligently track the spending. We found that a good way to deal with timely payments was to pay an amount every 2 weeks – during payroll. That way she didn’t face a large, once a month payment. You also get a certain level of protection when buying on a credit card that you don’t get when paying by other means. I agree with everything you say. I also have two credit cards: one for business and one for my personal use. It can sometimes be stressful managing two credit cards but in the long run, I think it’s worth it. If you guys don’t have one, you guys should really get one!